First, let me start my Countdown post today with a great big thank you for all of your kind words yesterday. I really do appreciate it... and there are so many of you that struggle with the same issue. So I'm glad I shared. So often we feel isolated in our grief, and sharing, communicating and creating can be such a valuable tool in healing. If you have no idea what I'm talking about, you can read THIS post to get caught up. If you're ready to see the next project in my Fall for Holiday countdown, well you're in the right place. I'm kind of excited about today's projects - yes, plural! You get a two for one today because I designed a fun, vintage-y card for you and then decided it needed a "companion." So I added a wine tag as well. I explain how the combo came about in my video today. 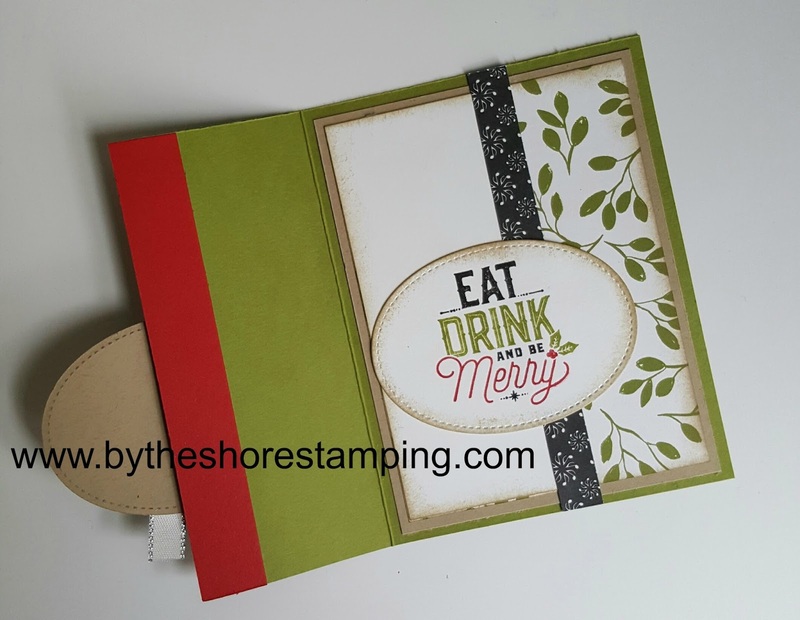 And if you're just joining me, be sure to jump back a few days here on the blog because I've been sharing a new project each day since September 1st (the launch of the new Holiday Catalog from Stampin' Up). We've covered fall, Halloween and now we're finally moving on to Christmas, seven days in! The card was based on a design I received as part of a swap earlier this year. It was originally created by Jamilla Ivits of Canada. 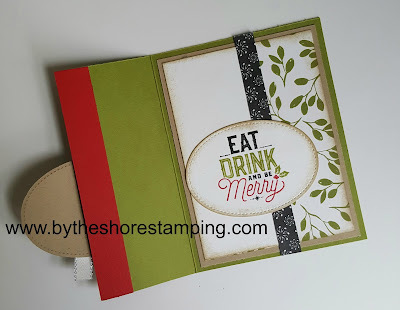 We made the exact card she created in card class a couple of months ago and it was so popular that I wanted to create it again using our holiday products. Really fun style, right? That's what I love about swapping (and one of the most fun parts of being a demonstrator -- lots of opportunities to "swap" ideas with other crazy talented demonstrators!). I give all of the measurements in today's video (and they are written right in the description of the video below if you click over to YouTube while watching). I also show you how I did the three different colors on my stamped image if you're not familiar with the marker to stamp technique. So I'm off to it. Remember if you'd like to see the new holiday catalog in my online store, you can view it HERE. If you'd like to download a copy of it, you can do that HERE. And if you'd like a hard copy of the new catalog and you don't already have a demonstrator you work with, I'd be happy to send you one... just email me at jenpitta (at) comcast (dot) net and I'll drop one in the mail for you. Also, if I've inspired you to order any of the new goodies (which I'd be oh so grateful! ), please be sure to use the hostess code WK7DFWJ7 at checkout. And don't forget, I have a fun online Facebook party scheduled to culminate these 12 days of creative inspiration... so be sure to join us there, too! Until tomorrow... have a great day! Wonderful gift idea and not just for Christmas! More techniques to learn - Terrific! This is a great project, Jen---fun use of the DS papers and I love how the tag and card coordinate for the perfect hostess gift. I love the way you can tie the bottle tag with the card, its like 3 gifts in 1! More great ideas! Thanks for showcasing the markers for coloring the stamps, I love the multi-color look they create! As usual, your craftiness has me in awe!